made him Ireland's patron saint and one of the Church’s most beloved missionaries. 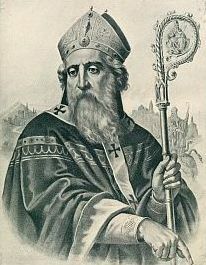 Born in Britain shortly before the 5th century, St. Patrick, pictured below, was taken captive to Ireland by raiders at the age of 16. He lived there for six years as a shepherd under harsh conditions and became intensely devoted to God in prayer, as he puts it, “because the spirit was then fervent within me.” Tradition has it that divine dreams inspired both his escape from captivity in Ireland and his return there later in his life as a bishop. St. Patrick's prayer no doubt helped him in his missionary efforts. Although he faced his share of resistance, St. Patrick was so successful in preaching the gospel and organizing the Church in Ireland that he is largely credited with converting the Irish to Christianity. and the Shamrock he used to great effect to explain the Holy Trinity. St. Patrick's prayer for the faithful, much like the famous Breastplate prayer also attributed to him, can truly inspire us to ask for divine assistance in living our faith each day. As Our Lord said in Matthew's gospel, if our requests are in accordance with His will, “ask, and it shall be given you; seek, and you shall find; knock, and it shall be opened to you” (7:6). The “Strength of God” mentioned in the first line of this prayer should give us strength indeed!